[Product resource]: Extracted from Peanut shell or semisynthesized from Rutin which is extracted from Sophora flavescens Ait. 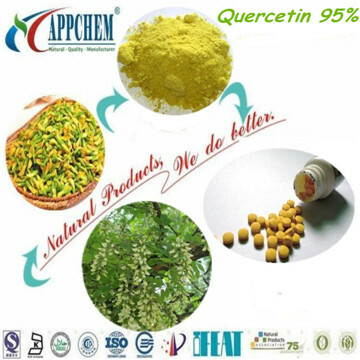 [Application scope]: Quercetin has a good expectorant, cough effect, and have some asthma, for the treatment of chronic bronchitis. There are also lower blood pressure, increased capillary resistance, reduce capillary fragility, blood fat, expansion of coronary artery, increase coronary blood flow effect on coronary heart disease and hypertension in patients with adjuvant therapy.